This post is part of a series on addressing animals’ fear in the veterinary clinic. Contrary to what many vets have assumed, there’s no evidence to indicate that it should be riskier to feed treats with the purpose of reducing fear in animals about to undergo sedation. There may be other reasons to avoid treat feeding, but that one is seemingly not valid. Habituation (simply grabbing the animal and getting on with it) is slow, unreliable and risky. Rather, gradually introducing potentially aversive stimuli using systematic desensitization (SD) is less unsafe. The combined procedure (SD/CC) is more efficient than either procedure (SD or CC) alone. So, should you feed or not? What are the advantages? What are the potential disadvantages? There are mainly advantages of using SD/CC in the veterinary clinic, and mainly disadvantages of not doing so. 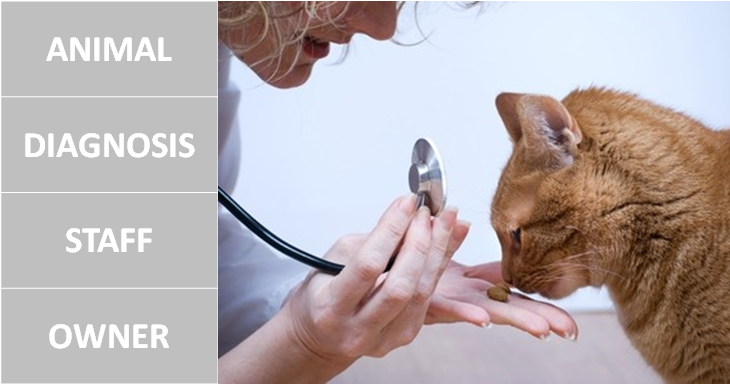 I propose that there are at least 4 robust reasons why you should feed treats to reduce fear in the veterinary clinic, with regards to the animal, the diagnosis, the staff and the owner. Firstly, the animal. If you or the vet are not consciously trying to prevent or reduce fear, chances are that the animal is going to become more stressed on subsequent visits. Hypothetically, there could be an increased risk of Aspiration Pneumonia (AP) after sedation if the animal’s stress levels are high – though this hasn’t been studied. 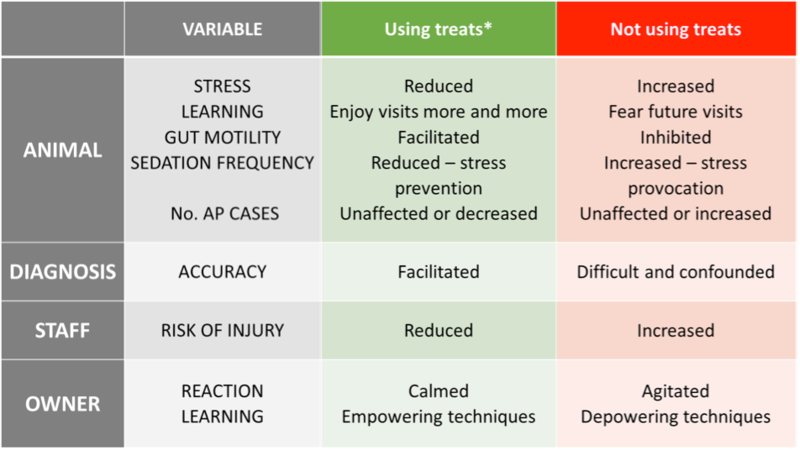 In contrast, using treats to actively prevent or reduce fear through SD/CC should have opposite effects. Small amounts of fluid treats shouldn’t increase the risk of AP. Secondly, the diagnosis. When animals are stressed, their bodies respond with a series of complex short-term physiological reactions. Some of these may be mistaken for diseases that cause similar physiological reactions. For instance, stressed cats are sometimes misdiagnosed as diabetic. Conversely, if you’re successfully counterconditioning, animals become more manageable, easier to examine and diagnose, and such confounding effects may be reduced. Thirdly, the staff. Most veterinarians, vet techs and animal caretakers have been scratched, bitten or kicked by animals attempting to get away from an aversive situation. By using SD/CC, the risk of defensive aggression is reduced. Fourthly, the owner. Some 58% of cat owners and 37% of dog owners say their animal hates going to the vet’s. So, many animal owners avoid taking their pet to the vet, and the very thought of doing so makes 38% of cat owners and 26% of dog owners anxious. Using SD/CC can have tremendous effect on both the animal – and the owner. Additionally, the owner can learn useful techniques that may be used to reduce fears in other situations. So, to conclude: feeding treats at the vet’s is not pampering the animal. It reduces stress in the animal and owner. It reduces hazards to staff involved in handling animals. Diagnosis is facilitated. Finally, what are the alternatives? If staff are manhandling the animals to examine them properly and carry out procedures, owners may copy this behaviour in other situations which may impact the animal’s welfare down the line, in addition to all the problems listed here. Exceptions? Yes. There will be situations where treat feeding is not advisable for medical reasons, but some of the risk associated with sedation is unfounded. The reasons why animals vomit when sedated is not because they’ve eaten, it’s because they’re given anesthetics that make them vomit. Choosing another anesthetic should diminish the risk of vomiting, although, as one reader pointed out: all medications have side effects and the pet’s own physiology and health must guide the choice of sedative. … Do you agree? If not, why? Let us know in the comment section below! I give online courses on the topic of animal behaviour management, publish the odd blog post and give free webinars. Wanna be notified whenever any of those things happen? Sign up below! Rand et al., 2002. Acute stress hyperglycemia in cats is associated with struggling and increased concentrations of lactate and norepinephrine. Volk et al., 2014. Bayer Veterinary Care Usage Study. Westlund, 2015. To feed or not to feed – counterconditioning in the veterinary clinic. My dog is so shut down with fear at the vet’s that she won’t even eat her favourite treats. It’s not nice but she has ongoing issues and needs regular visits. Difficult all round. And yes, I myself am stressed about it! You say that habituation doesn’t work but desensitisation does. But how to desensitise this complex experience? It ain’t toenail-clipping, that’s for sure! Habituation works in some scenarios, but in the vet scenario there’s trigger stacking, so the type of habituation that is more likely to succeed is systematic desensitization, ideally in combination with counter conditioning. If possible, find the triggers and work with then one by one, alone first and later in combination. An animal who is shut down is very difficult to train – can you try visiting another veterinary clinic that doesn’t carry the same learning history? I only have one…. Complaint about giving treats. My dog is highly food driven, almost to a fault. He LOVES going to the vet. So much so that we can’t go by without him getting excited/anxious and becoming crazy excited to get in the door to see the staff. It’s a little nuts since he’s a SDiT and this is the only place where he acts that way. I’m grinning… I apologize- I realize this could actually be quite problematic, but it is pleasing to hear that your dog likes going to the vet! Perhaps you could try to diminish some of the enthusisasm by eliminating some of the contrast. So – getting some of those fabulous treats OUTSIDE the vet context. Or reinforcing calm behaviour. Or using lower value treats. Or reinforcing with petting instead (assuming it’s also reinforcing). I have a friend who works a lot with “on/off” exercises – alternating between excited play and relaxation… Good luck! Feeding treats is especially important in puppy visits. I teach large breed puppy’s to hop onto the lift table. By the time the 6 mo puppy comes in they charge to the table and sit on it. Owners are amazed that their dogs forever enjoy coming to the vet. Next PostNext How to become a better animal trainer.